We did this walk on Sunday 10th October 2010. We were down to three of us for this stage and I made my way straight to Hambledon to await the arrival of Derek and Sara who were meeting up at the end of the stage in Haslemere. 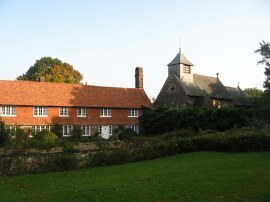 Once we had all met up at Hambledon we set off from the church, photo 1, heading just a few yards down Church Lane before taking a footpath on the left that heads diagonally across a couple of fields to reach Hambledon Road. Turning left, the route then follows the road as it heads round to the right into Malthouse Lane. Just past the entrance to St Dominic's School the Greensand Way joins a footpath on the right that heads uphill through the woodland of Hambledon Common, photo 2. The day had started grey and gloomy but the early morning cloud had soon burnt off and by now it was a beautiful autumn day for walking with a bright cloudless sky with only a slight breeze and temperatures which eventually reached around the 20c mark. As we headed uphill there were good views across the surrounding countryside, the hills in the distance still hazy from the early cloud, photo 3. Reaching a broader track the route heads downhill to the left to reach a road, Cherryhurst, which is followed down to the A283 Petworth Road. Heading across the road the route joins a footpath running between houses to Combe Lane. Crossing the road we headed down to Witley Station where we crossed over the railway lines using the footbridge between the two platforms, only to realise that the actual route of the Greensand Way uses a footbridge a bit further up towards Coombe Lane which can just be made out at the end of photo 4. Turning around we retraced our steps only to then discover that this footbridge was now closed, photo 5, with a signposted diversion using the bridge we had initially crossed. Retracing our steps again we went back over the bridge between the platforms, headed to far end of Platform two where we turned to the right along a track that soon linked up with the footpath the carries the signed route of the Greensand Way. Back on course the route heads down a footpath to Station Lane. Reaching the end of the lane the route continues ahead to reach to Brook Road before turning to the left along a path that leads, quite steeply at first, up to Bannacle Hill Road. The route then heads uphill along the road to its junction with Church Lane. Turning to the left, the route soon leaves this road along a footpath that heads off to the right gradually bearing away from the road along a fence line with trees to the left. For a while the path runs along the edge of a field on the right from where there were good views over to the North Downs. Just before the field edge bends sharply to the right the Greensand Way heads back into the trees and joins a sunken lane that heads downhill to the left to reach the A286 Haslemere Road. Crossing the road the Greensand Way then heads up Bowlhead Green Road. 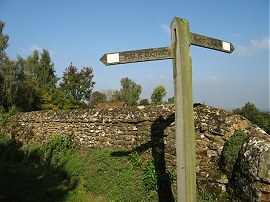 When the road reaches a house on the right the route heads through a tall metal kissing gate built into a stone wall, photo 6, which leads into Furzefield Wood. 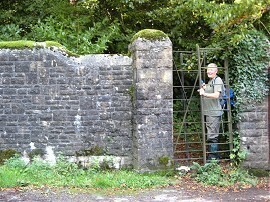 The gate itself was very narrow and we all had to take off our rucksacks to fit through. 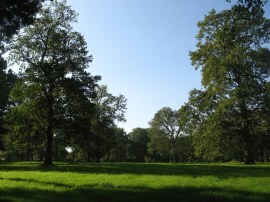 The route heads across a corner of the wood and then out over more open ground, photo 7, in what was once the grounds of Witley Park. Leaving the trees the route heads along a track running between fields before passing through another of the tall kissing gates at the end of Lower House Road. Continuing ahead the route heads half left over two small paddocks and crosses another driveway by a stone wall, photo 8. The route then heads to the right along a field edge path which is followed round to French Lane, passing yet another fine house on the right. Once over the road the path crosses the middle of a field to reach a band of trees on the far side. Here the path heads downhill through the trees, at one point heading down a small flight of rather uneven stone steps. Leaving the trees the route joins a driveway that runs past the buildings of Cosford House before heading to the right along a track. 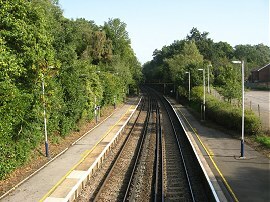 The hedge lined track runs besides fields before bending round to the left to reach the A3. On my map the route is shown as continuing straight across the road however the route of the Greensand Way has been altered and now heads to the left along a service road running alongside the A3 for a hundred or so yards before heading through a tunnel under the road and then heading back down another service road on the other side of the A3 to rejoin the original path. Normally the road would have been busy with traffic but fortunately the A3 was shut for the weekend so all was quite and peaceful. I was unsure why the rod was shut but have subsequently found out it was to enable the Highways Agency to clear trees alongside the existing A3 in preparation for returning the road to nature once the new A3 is open. The work was being done at this time as it is the last winter period outside the bird nesting season (when such work is very difficult) before the tunnel opens to traffic. From the A3 the route heads along a field edge and then across a corner of a second field which was planted with a tall crop of maize before reaching houses at Thursley. 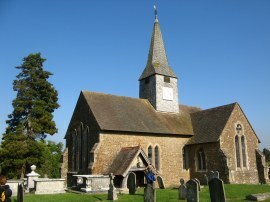 Here the route heads along Highfield Lane for a short distance before crossing a stile into the churchyard of St Michael and All Angels Church, photo 9. 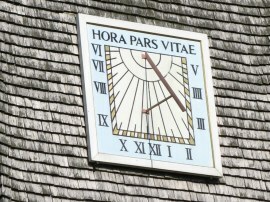 On the spire of the church was a sundial, photo 10, which was giving a reasonably accurate reading of the time in the bright sunlight. A Greensand Way link path heads from Thursley to Farnham however we headed to the left from the churchyard along a narrow hedge lined path running between fields. At the end of this path the route bears to the right across a field to join a road. Here the route heads uphill to the left before joining a footpath on the left that cuts across the corner of a field to join a track that runs up to Hedge Farm. Here the route rejoins Highfield Lane heading to the right along the road. After a while the road becomes an un-surfaced byway with what seemed to be two very superfluous national speed limit signs on either side of the path. 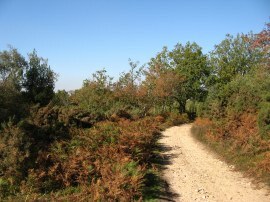 The tree lined byway starts heading steadily uphill towards Hindhead Common where the route starts passing through more open heathland of the common along a sandy path, photo 11, that runs along the edge of the Devils Punchbowl, photo 12. 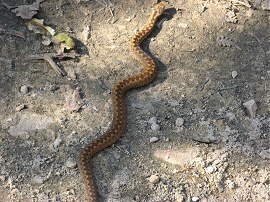 As we were heading along the path Sara almost trod on a small adder sunning itself on the path. For a while it remained curled up but soon stretched out, photo 13, and disappeared off into the undergrowth. 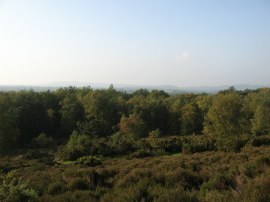 It really was a glorious day to be out walking over the sandy heathland under the bright blue sky with the autumn colours just about starting to show in the leaves of the trees. Continuing ahead we crossed back over the deserted and thankfully silent A3, photo 14, joining a surfaced track running parallel with the road that heads up towards the summit of Gibbet Hill. Approaching the top of the hill there were waymarkers for an A3 tunnel viewpoint although not knowing how far away this was we kept along the Greensand Way heading along a footpath to the top of the hill. 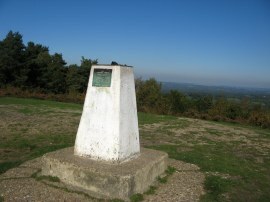 Gibbet Hill stands 272 metres above sea level and is the second highest point in Surrey. 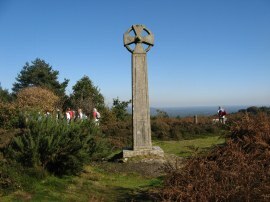 On the summit of Gibbet Hill stands a Celtic cross that was erected there in the 19th century, photo 15. 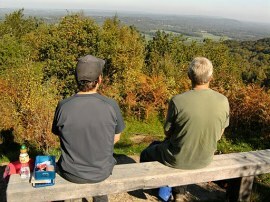 There was another large group of walkers at the top of the hill although these soon went on their way and we were able to stop for our lunch break, sitting on a bench over looking the views back along the Greensand Ridge to Leith Hill and beyond, photo 16. There was also a trig point on top of the hill with a small panorama on the top giving the distances to various locations, photo 17. 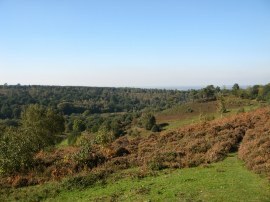 From the summit of the hill the route follows a well signposted path that makes its way across the top of the common, firstly through trees and then across a more open patch of ground to eventually reach the A3 on the edge of Hindhead by the National Trust Car Park. The route heads to the left along the road for a very few yards before joining a track on the left, that heads back into the trees, at first besides a pub then with gardens on the right. This path is followed downhill through the trees, where a lack of Greensand Way signs made us wonder if we were on the right route, before heading to the right along a path that is running along the bottom of Polecat Valley. 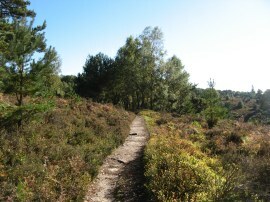 This path gradually bears to the left, heading uphill slightly before following an undulating route over the heathland, photo 18, then through a denser area of trees to reach the Farnham Lane. Here the route heads to the right along the road before turning to the left along a byway, Stoatley Hollow. 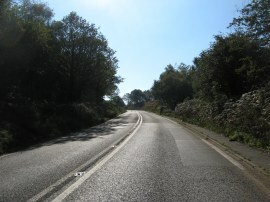 This is followed as it heads gently downhill to reach Bunch Lane where the route heads to the left. 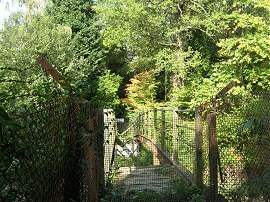 The Greensand Way heads along the road for a few yards and crosses over a small stream before joining a footpath on the right. 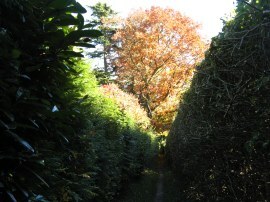 This path, which has fields to the left, is followed down to Weydown Road on the outskirts of Haslemere. Here the route continues ahead, joining a narrower hedge lined footpath on the other side of the road, photo 19, which is followed down to High Lane. 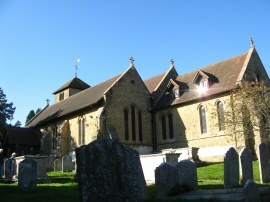 Here the route heads to the right, continuing on into Church Lane by St. Bartholomew's Church, photo 20. Church Lane heads round to the left and shortly after crossing over a rail bridge the route joins a paved footpath that heads diagonally off to the right. 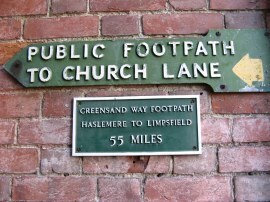 This footpath is followed along to join a narrow alley that heads down to Haslemere High Street where a small plaque on the alley wall, photo 21, marked the end point not only of this stage of the Greensand Way, but of the entire route itself from its start point back in Ham Street. 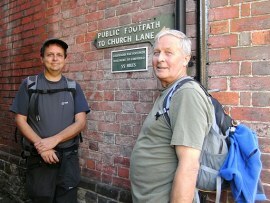 At the end of the stage we had walked another 12.2 miles along the Greensand Way. This had been one of the more pleasant stages of path with the route around the Devils Punchbowl being particularly pleasant. All in all the Greensand Way had been a very pleasant recreational trail to walk from the orchards of Kent to the heathlands of Surrey with very few unpleasant or tedious sections of path in between. Having completed the Greensand way, next month the walking group starts on the High Weald Landscape trail, heading from Horsham over to Rye. 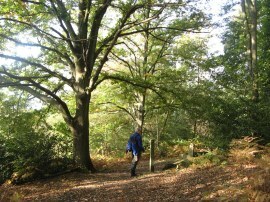 As usual I have uploaded the route of the walk which can be accessed here: Greensand Way 8 Route.